These puffed pastry strawberry key lime cups are the perfect way to celebrate Spring with a fresh and tempting bite-sized dessert! Start by preheating your oven to 450 degrees F., and remove the puff pastry from your freezer to allow it to thaw for about 45 minutes. Additionally, pull the cream cheese from the fridge to soften while the pastry softens. Next, use a biscuit cutter to cut out nine crusts from the sheet pushing the dough down into the liners with your thumb. Transfer the crusts to the cupcake pan and bake for 15 minutes in a 450 F. degree oven. Once done, let the cups cool. Afterward, while the dough bakes, blend the cream cheese, key lime juice, and sugar for two to three minutes until filling is airy and smooth. Then set it inside your fridge for about 15 minutes to firm. Wash your strawberries and mint. Use a knife to quarter the strawberries and remove the stems from the mint leaves. Now that everything is prepped you can begin assembly. 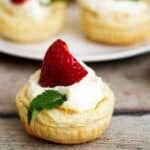 Inside each cup, put approximately one tablespoon of filling and top it off with the quartered strawberries and a mint leaf. Serve immediately or store for up to two days in your fridge. The calorie count listed in an approximation based on 9 servings. If the pastry puffs up during the cooking process, allow it cool and then use your thumb to push the cups back down.